10% Discount on all orders of $100.00 or more. The manufacturer of Mimbreno China has discontinued production of dinnerware in the burgandy color. The replacement color will be brick red. There is some availability of remaining burgandy stock. The Atchison, Topeka and Santa Fe Railway is celebrated in print, song and film as the railroad that opened the Great Southwest. Along with the railroad came the legendary Fred Harvey Company, operator of the Santa Fe's meal stops, hotels, and later, its dining cars. The AT&SF accepted the identity of the old west as its own. Its stations, timetables, and trains reflected the Spanish and Indian cultures that so fascinated the rest of the country. That tradition reached its zenith in the stainless steel streamliner, "the Super Chief" of 1936. From engine to tail car, the decor was as authentically Native American as good taste and the car builder's art would allow. Mary Colter served both the Santa Fe and Fred Harvey as designer and Indian art expert. Then 66 years old, Colter combed museums for suitably authentic designs, deciding finally on motifs from the ancient tribe of the Mimbres Valley. Like other elements of the train's interior, her china adapted the Mimbres stylized likenesses of animals and symbols of natural elements without sacrificing the spirit or honesty of the originals. 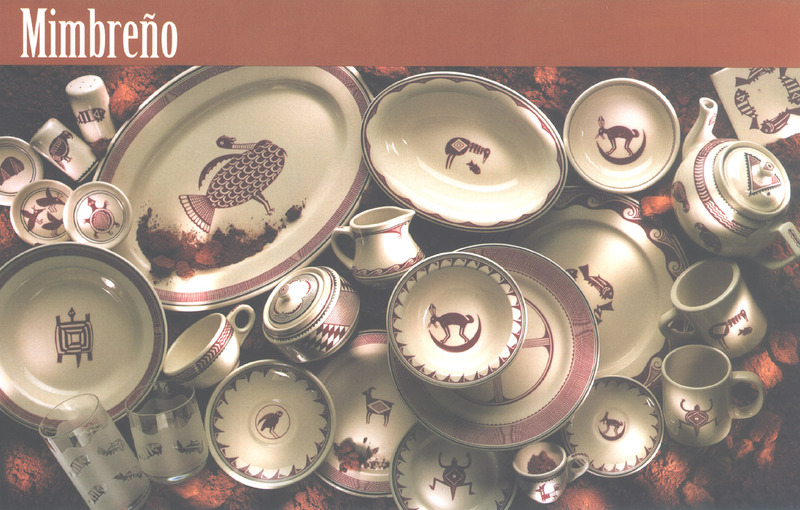 The Onondaga Pottery Company produced Mimbreno from 1936 to 1970 exclusively for the Santa Fe Dining Car Department. It was used on all of their diners until the end of service in 1971, whereupon it became even more highly coveted in the collector's market. Our Mimbreno is the same hotel grade, vitreous china used on the dining cars for nearly a century. We have matched the shapes as closely as possible to the prototype pieces. All ware carries the elaborate Santa Fe backstamp updated with Pipestone's name and the word "reproduction".